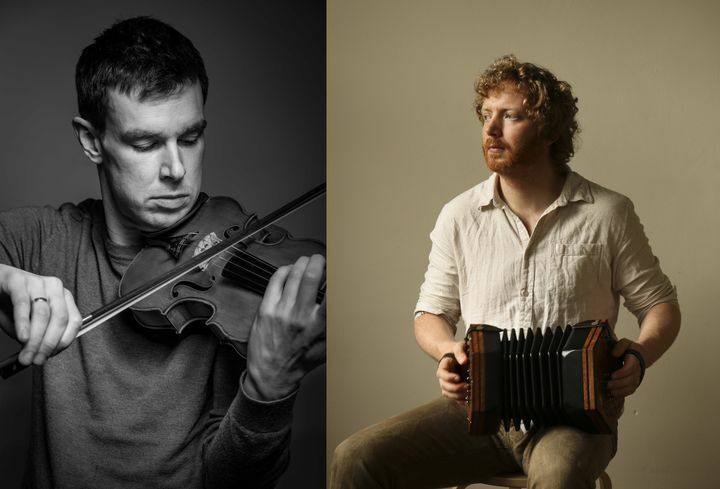 Liam O Connor and Cormac Begley have forged an exciting fiddle and concertina duet. Liam, one of Ireland’s leading fiddle players, was born into a musical family in Dublin and his solo album “The Loom” has received 5 star reviews and was voted Traditional Album of the Year by the Irish Times in 2017. Cormac is a bass, baritone, treble and piccolo concertina player from a West-Kerry musical family. His debut solo album has received critical acclaim amassing nine 5-star reviews to date. They played their first concert together at the National Concert Hall in late 2017 and were both nominated for instrumental musician of the year at the inaugural RTE1 Folk Music Awards in 2018.